Stage 2 is built for the sprinters. Taking in mostly wide, flat roads with just a few changes of direction, there is only one very steep, short categorized climb in Zikhron Ya’aqov. A fast finish in Tel Aviv awaits. Elia Viviani (Quick-Step Floors) won the second stage of the 2018 Giro d’Italia in Tel Aviv ahead of Jakub Mareczko (Wilier Triestina) and Sam Bennett (Bora-Hansgrohe). Rohan Dennis (BMC) took an intermediate sprint out on course to take the pink leader’s jersey from Tom Dumoulin (Sunweb). 2. Jakub Mareczko (Wilier Triestina- Selle Italia), s.t. 3. Sam Bennett (Bora-Hansgrohe, s.t. The final kilometers were marked by chaos as the peloton was forced to navigate numerous tight corners and deal with constant attacks launched by opportunist looking to upset the sprinters on the opening road stage. Viviani found himself buried deep in the bunch with two kilometers to go, but deftly navigated the chaos to move into prime position with 500 meters remaining. Marcezko was the first to open his sprint and Viviani was able to jump directly into his slipstream and easily come around his countryman for his second career Giro d’Italia stage win. The 167-kilometer stage from Haifa to Tel Aviv was hotly contested from the gun, with a few riders attempting to seize the opportunity to take the race with the bonus seconds on offer at the intermediate sprint points. A breakaway containing Lars Bak (Lotto-Soudal), Davide Ballerini (Androni Giocattoli), and Guillaume Boivin (Israel Cycling Academy) was never given a significant gap due to the pace of the Dennis’s BMC teammates. Approaching the second intermediate sprint with 60km remaining, the breakaway was reeled in as BMC strung out the field to set up Dennis for the sprint. Coming off an extremely fast leadout, the Australian was able to take the win against Viviani and grabbed three bonus seconds to take the overall race lead. After the stage, Dennis credited his strong team and the generosity of Viviani for his newfound race leadership, “The team rode for me in the last 30km into the sprint, and even before so Campenaerts didn’t get it up the road. They delivered me perfectly. 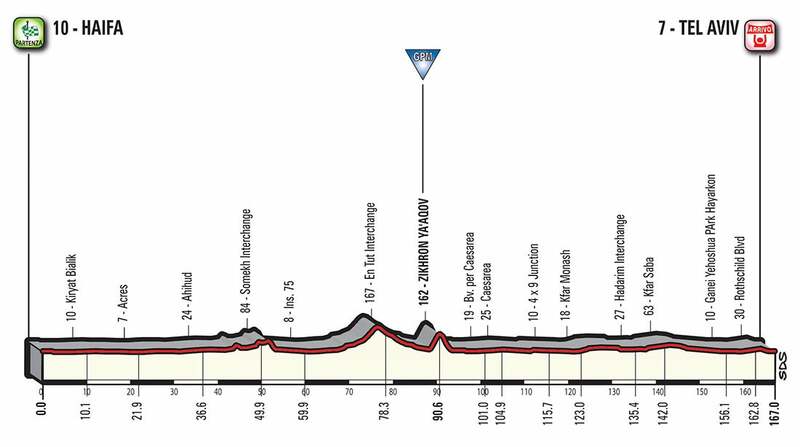 Sunday’s stage 3 is the longest stage of the 2018 Giro at 229 kilometers. The route heads through the Negev Desert and leads the peloton to the sea-side resort town of Eilat for a likely sprint finish. With bonus seconds on offer at intermediate sprint points, expect to see another lively stage as Victor Campenaerts of Lotto Fix All will look for any opportunity to close the three seconds behind himself and the race lead. The Giro returns to Italy after tomorrow’s stage.